The picture shows (left to right) Jim Greene from the network platforms group at Intel (sponsors of the awards ceremony) who presented the award, with Pieter Coucke and Petra Liesmons from Medialaan and David Springall from Yospace. Viewers watching live channels on Stievie can rewind the live stream. What makes this solution unique is that, in startover mode, commercial breaks are made shorter by tailoring the spots to the individual, and breaks that have already been seen are made skippable, so the viewer can catch up with the live action. 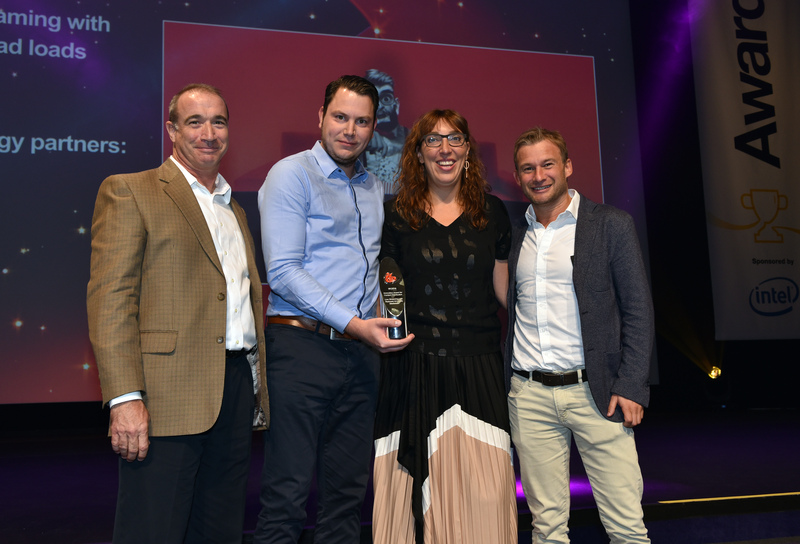 While the amusing video describing the system to the audience at the IBC Awards Ceremony showed an infinite number of monkeys making the advertising selections for each viewer, the solution in fact depends upon the Yospace server-side ad insertion platform (SSAI). The result is a fully personalised, end-to-end stream management. Belgium’s leading commercial broadcaster, Medialaan, has chosen Yospace’s Dynamic Ad Insertion (DAI) system to monetise live channels on the new TV everywhere service, Stievie Premium. The renewed, paying version of Stievie’s online television service is available since Monday 21st August 2017. This new Stievie Premium edition offers 18 live TV channels and catch up services, up to six days, and can be viewed on all screens: smartphone, tablet, laptop and TV screen. It is even possible to schedule recordings. The offer includes the Medialaan channels VTM, Q2, Vitaya, CAZ, VTMKZOOM, KADET and Qmusic; VRT channels Eén, Canvas and Ketnet; SBS channels VIER, VIJF and ZES; complemented by Discovery channels Eurosport, TLC and Discovery and the channels provided by FOX: National Geographic and Nat Geo Wild. All of these stations together account for almost 90% of the audience watching television in Flanders. This package is available for €9.99 euros a month. The project is particularly innovative because it enables “start-over” streams. In what is a world-first, viewers are able to use scrub controls to rewind a live stream in a program. Ad breaks for viewers using this capability are made shorter so they are able to catch up with the real-time live programming. Yospace’s award-winning platform allows advertising to be served in live channels online in a way that is so seamless that it is true to the user experience of broadcast television, while allowing new ads to be curated to the interests of each viewer. Stievie Premium is available on iOS, Android and web platforms.